When little John Wisden launched his even smaller Almanack in 1864 he didn't know he was creating an institution - he thought he was establishing a nest egg for his retirement from a successful cricket career with Sussex. 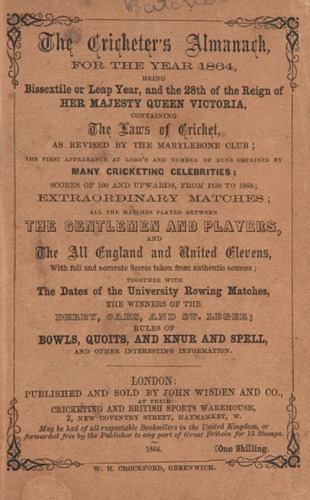 That slim 112-page volume, which now costs a fortune, detailed the 1863 cricket season, with space left over for esoteric lists of canals and English Derby winners. It was one of three or four similar books around at the time, as publishing took off in England, but it's the only one that has survived. To begin with, that was more a matter of luck than judgment, but latterly Wisden's reputation has been based on its statistical accuracy and editorial independence. Not many people read it from yellow cover to cover, but it's comforting for the enthusiast that if he wants to know who won the toss in the 2002 Ranji Trophy final, he can find it (Railways, since you ask: page 1499 of the 2003 edition). Wisden is more than figures, but its fame is founded on them. It arguably started the modern fascination with statistics, and set the standards for their accuracy and presentation. "Wisden says …" is usually the clincher in any cricket-related argument.